Oswald in the Doorway (not) : the blog of the Oswald Innocence Campaign,debunked by Lance Uppercut: Idiot Meltdown! UPDATED! I have often said that as long as someone advocates for Oswald in the doorway, I don't care what else they believe about the JFK assassination. But, that is being pushed to the breaking point by Richard Hooke, and I consider it a crisis for the organization. Richard is now maintaining that Oswald was up on the 6th floor at the window with his Carcano rifle, scheduled to shoot Kennedy. Also up there were Mac Wallace, Loy Factor, and Ruth Martinez. But close to the last minute, Oswald carefully arranged three empty shells to leave a clue for police, and then he rushed downstairs and placed himself at the top of the doorway. He knew very well that other assassins were going to kill Kennedy, but he did nothing to stop it .He could have run out into the street to stop the motorcade from entering the Kill Zone. He could have pointed to the tops of buildings and yelled, "Stop! Gunmen! Assassins!" but he didn't do it. Yet, for some reason, Richard still thinks he should get the medal of honor. Could he have been shot himself? Maybe, but not by the assassins. If they shot him, it would only have proven that he was right- that there was a deadly ambush waiting. So, they would have been powerless. But, there is a chance that police, FBI, or SS would have shot him, and that's what would have made it a heroic act. But, even if he didn't want to risk his life to save Kennedy, why would he have stopped at the back of that doorway, just outside the door? If he was thinking of himself, he would realize that he needed witnesses to see him, as many as possible. Remember what Richard Case Nagell did? So, why wouldn't Oswald have gone well out into Dealey Plaza, among the crowd, so that lots of people would be able to see that he was out with them and not up on the 6th floor? Standing way in the back of that doorway, Oswald had no way to know that his picture would be taken. He couldn't count on that. At that point, to save himself, he needed to get out into the light- into the open. Then afterwards, according to Richard, Oswald continued to collaborate with the killers, getting into a car with Mac Wallace. Now, if Oswald had just sabotaged the plan and aborted his assigned role to kill Kennedy, wouldn't that have changed everything? But, according to Richard, Oswald sped off with the very same people, the killers, and they not only didn't mind, they actually turned the car over to him and let him drive around by himself and make his own way to the theater. But, if Oswald had just aborted his role in the mission, why did he continue to do as the killers expected? Why did he go to the theater? Why instead didn't he drive himself to the PD and tell police what he knew? Why didn't he do that in Dealey Plaza? Even by 12:40, the place was swarming with police. Why is Lee Harvey Oswald a hero if he didn't do everything he could to save JFK's life? How could he have been both the designated patsy and a designated shooter? Why would they have needed him for both? And why after he was arrested did he not finally tell police the truth? Why did he lie, lie, lie? Why did he make up a story about riding the bus and cab? According to Richard, Oswald not only failed to take action at the last minute to save Kennedy, which he could have easily done, although at some risk to himself, but even afterwards, he continued to collaborate with the killers, and over two days of questioning failed to give any of them up. He protected them; he shielded them; he said nothing but lies. And yet, Richard thinks he deserves the medal of honor for that. I can no longer have any association with Richard Hooke. This is too much. It has gone too far. I feel he has lost his mind. It is simply impossible for me to go any further with him. He is not an advocate of Oswald innocence; he is an advocate of Oswald guilt. Not shooting Kennedy in a situation where other shooters were certain to shoot and kill him is tantamount to killing him yourself. Even if Oswald didn't pull the trigger, if he knew what was about to happen, and he let it happen, then he is as guilty as those who fired. And the law backs that up. Not acting to prevent an imminent murder- especially of the President of the United States- would certainly be construed as complicity. Look at what just happened in the Boston Marathon case. Putting aside the whole issue of what REALLY happened there, some friend of the Tsarnaev brothers just got convicted of being complicit in the crime just for not coming forward to authorities with what he knew. You think they wouldn't have thrown the book at Oswald for the same reason? Of course, they would have. There is no doubt that they would have. The medal of honor? Oswald would have been lucky if he didn't get the electric chair. I will attach Richard Hooke's paper, if you want to read it. As I said, I am ready to take drastic action to dissociate from Richard Hooke. OIC members are having a brisk discussion about the latest blasphemy from Richard Hooke, which is that the Oswald we know was part of the hit team up on the 6th floor, that he was there in the Sniper's Nest until practically the last minute. But then, he left suddenly, leaving Mac Wallace, Ruth Martinez, and Loy Factor up there- according to Hooke. And they apparently didn't care, or at least they didn't stop him or do anything about it- according to Hooke..
And then after the assassination, according to Richard, Oswald rejoined the team. He got into the car with these killers and drove off with them. And then, despite what he had done, they turned the car over to him, and he made his way to the theater alone, as instructed. And then after he was arrested, according to Richard Hooke, Oswald lied to police, telling them that he took the bus and cab in order to protect the killers. And he didn't say one word about all that he knew about them and what happened. He protected them. He shielded them. He guarded them- with his life. This is what Oswald did for the killers of JFK, according to Richard Hooke. Well, one of our members, Pat Shannan, who works closely with John Armstrong, pointed out that all of what Richard said is true, but it applies to LEE, not HARVEY. There were TWO OSWALDS. LEE is the one who was up on the 6th floor. Harvey is the one who was in the doorway. LEE is the one who got in the Nash Rambler, which Roger Craig and others saw. HARVEY is the one who took the bus and cab. LEE is the one who shot and killed Tippit. And LEE, like Harvey, wound up at the Texas Theater. He was in the balcony while HARVEY was downstairs in the main room. And while HARVEY was let out the front after his arrest, LEE was led out the back where he was seen being led out by Bernard Haire of Bernie's Hobby Shop, as reported by Jim Douglass. Pat Shannon, I agree with you, and also with Jim Douglas and John Armstrong, that it was the Oswald double, whom we call "Lee" in contrast to "Harvey" who was up on the 6th floor with the hit team. Douglass said it JFK and the Unspeakable, and John Armstrong said it in Harvey and Lee. And many others have said it. Mr. BALL - Did you talk to Oswald again that morning? Mr. JARMAN - Yes, sir. I talked to him again later on that morning. Mr. BALL - About what time? Mr. JARMAN - It was between 9:30 and 10 o'clock, I believe. Mr. BALL - Where were you when you talked to him? Mr. JARMAN - In between two rows of bins. Mr. BALL - On what floor? Mr. JARMAN - On the first floor. Mr. BALL - And what was said by him and by you? Mr. JARMAN - Well, he was standing up in the window and I went to the window also, and he asked me what were the people gathering around on the corner for, and I told him that the President was supposed to pass that morning, and he asked me did I know which way he was coming, and I told him, yes; he probably come down Main and turn on Houston and then back again on Elm. Then he said, "Oh, I see," and that was all. So, Harvey did not know that the motorcade was going to pass the building that day. And if you think otherwise, you have to explain why Oswald pretended not to know to Junior Jarman. Why would he put on such an act? And if he did put on such an act, how can he possibly be considered innocent? I'll tell you something, Pat. In a way, I'm glad it's come to this because now it puts the whole issue of Harvey and Lee right in the center of the cauldron. Richard Hooke is so determined to deny the reality of the Two Oswalds that he is willing to turn the one Oswald into a monster. Richard thinks that so long as Oswald didn't fire at Kennedy himself that it makes him a hero. But, with all the shooters they had perched, JFK was a dead man anyway- with or without Oswald shooting. In fact, Oswald refraining from shooting did NOTHING to help or save Kennedy; he was just as doomed. It's unlikely Oswald would have hit him anyway because he was not a good marksman, and he had NO experience at the kind of shooting that was involved. If Craig Roberts, a military sniper, didn't think he could do it, how could Oswald have done it? It was no good luck for JFK that Oswald didn't fire, but it may have been Godsend for Jackie. 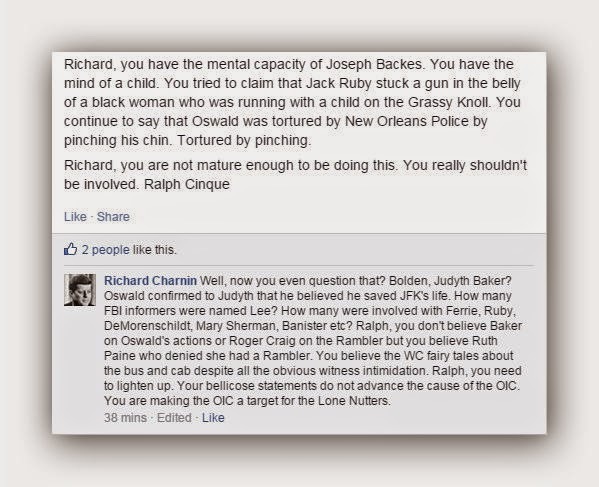 So....Ralph is ready to boot Richard Hooke from the O.I.C, and he's attempting to rally the other "Senior Members" to his cause. But....there's a problem. Several problems, in fact. It's not surprising that Ralph has chosen to place acceptance of John Armstrong's "Harvey and Lee" theory at the centre of his disagreement with Hooke because apart from the ludicrous Cinque "Doorman" scam, Armstrong's book is probably the most contentious and devisive issue faced by the JFK research community ( well, unless you count Judyth Vary Baker.....but that's an issue for another time ). And we have come to see very well over the past few years that the O.I.C is solely about division, misrepresentation and the trivialisation of serious JFK research. But in taking this stand Ralph risks a much more serious division than his handbags at dawn spat with Hooke. O.I.C Chairman Jim Fetzer has dismissed "Harvey and Lee" as a "fantasy". It's one of the few things I agree with him about. Judyth Baker, forced into the O.I.C against Ralph's wishes purely for the promotion of her ridiculous "pixel analysis" of the Altgens photograph ( about which I'll talk more at some point, but for now suffice to say that it's so bad even Ralph won't use it ) agrees with him. Richard Charnin is in broad agreement with Hooke. What of the rest of the O.I.C senior membership? It's difficult to know, since almost all of them never utter a word in support of either the organisation or it's founder. But one thing's for sure, senior members of the Oswald Innocence Campaign....it's crunch time. It's time to speak up. It's time to CHOOSE YOUR IDIOT. 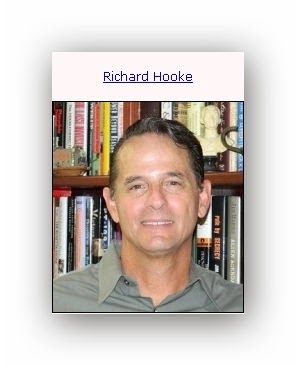 Sadly, Richard Hooke doesn't begin to approach the mental capacity of Joe Backes, a man who has forgotten more about the case than the combined knowledge of Cinque, Hooke and Charnin put together. Still, it's heartening to see that the O.I.C membership is slowly starting to realise the truth about their great leader. 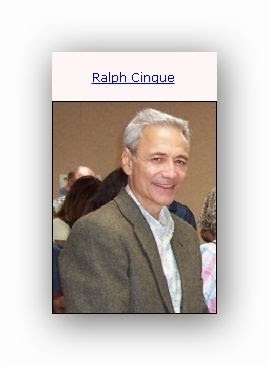 How many will Ralph ban? Is there an O.I.C splinter group on the horizon? It's a Schism, I tell you……. which side are you on? Depends on how much they'd pay you.